I have a serious problem. I love a clean house – a house completely devoid of clutter and chaos. I have three kids. Well, two kids and a husband, so clutter and chaos are inevitable. I can be somewhat obsessed with having everything in its place, but I like it that way. Unfortunately, once I had children I had to succumb to the fact that there would always be things out of place. We don’t have a dedicated “playroom” where I can shut the door and pretend like nothing is out of place. We have a dining room/living room/toy room area which I have transformed into a place where all of the kid clutter resides – neatly in cubes, categorized by type of toy, of course. At least 100 times a day you will hear me say, “All of the toys stay in the toy room.” This never happens. The toys don’t stay in the toy room, ever. 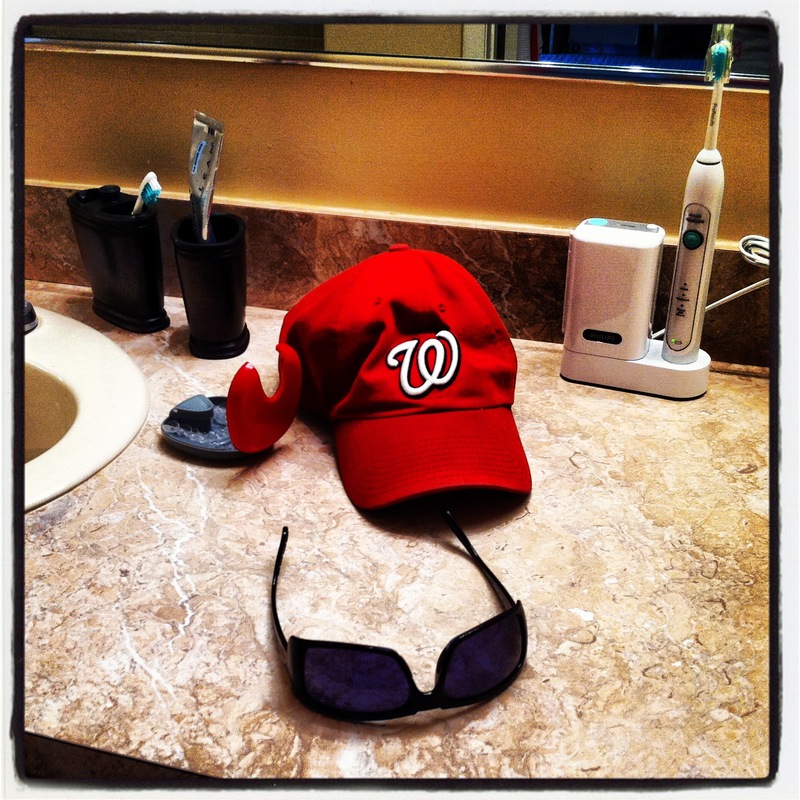 It is also pretty much guaranteed that you can walk into any room and find a baseball hat, sunglasses, or a beer bottle that has been left behind by child #3, aka my husband. I have spent a ridiculous amount of time picking things up and putting them away only to find them an hour later abandoned somewhere else, at which point I pick them back up and put them away again. It is a vicious cycle, but I can’t help it. I have genuinely tried, I promise I have. I know my friends won’t believe me, but one time I decided to just let everything be out of place. It wasn’t fun and I don’t understand how people live like that. I simply love to clean. I could spend my entire day cleaning and organizing and ridding my life of clutter. There are very few people in my life that can relate with me and it is a lonely place, a clean and lonely place. On the other hand, there are so many people that either ask me 1) to come clean their house or 2) how I keep my house clean and organized. I have a system that works for me and maybe it can work for you too. 1.) Clear room of clutter and anything that doesn’t belong– This is the #1 priority. Once the clutter is gone the room will be easier to keep clean and organized. Grab a laundry basket or better yet, I love my large utility tote from Thirty-One because it has handle straps. Look around the room and put anything that doesn’t belong into your basket. You will deal with this later. 2.) Conquer cobwebs and dust bunnies – Halloween and Easter are long over so it is time to clean up the remnants. Start at the top and work your way down. Grab a ladder. Get the cobwebs out of the high corners and don’t forget about the baseboards. I use my Magic Blue vacuum attachments to help me get into all of the little crevices. It is my favorite toy. I have tried other canister vacuums, including the Dyson, and this works best for me because I can get in, around and under everything. 3.) Dusting – make sure all surfaces are wiped clean. 4.) Vacuum/Mop – I love a clean floor and vacuuming is one of my favorite things to do. Bedrooms – wash the sheets, make the bed, purge the closet, clean out the nightstand drawer, gather the laundry and clean under the bed. Once a month or so, I also try to clean out my girls’ closets and pack up any clothes that no longer fit. Kitchen – clean out the refrigerator, empty/load the dishwasher, clean out cabinets and pantry for expired items, clean water dispenser area on refrigerator, clear your counter-tops, empty the trash,and shine your sink. Toy room – throw away any broken toys, gather any toys that are no longer age appropriate or unused, get baskets or tubs for holding toys. I have some reasonably priced shelving and boxes from Ikea to house all of the toys. Even if they aren’t organized by type like in my house, at least they can all be off the floor. During your blitz you should also get all of the crayon marks off the wall. Mr. Clean Magic Erasers work wonders for this and have many other uses as well. Rule #1: Find a place for everything and put everything in its place. Generally, if you can’t find a place for it, you probably don’t need it and therefore it is something you should part with at this point. Don’t be a hoarder. Look through that laundry basket of random items that you collected and either put them where they belong or get rid of them. This is the time to clear your cabinets and closets of unused items. The amount of useless garbage that accumulates in my house is obscene. I find great joy in getting rid of it. Really, I have no idea where all of the stuffed animals that I find come from. I know for sure I didn’t buy 99% of them and I didn’t want any of them. Rule #2: Do one load of laundry every day. This is not actually my rule; I got this from Fly Lady. I try to follow it as closely as possible but sometimes there just isn’t enough laundry to warrant the use of water and energy. In these instances I do a load every other day. This really helps keep me sane. The mound of laundry that my two kids accumulate doesn’t even make sense. If I let it pile up for an entire week it is far too much to manage in one day and ends up taking several days to wash, fold and put away. Try it. I did, and I got my Sundays back. 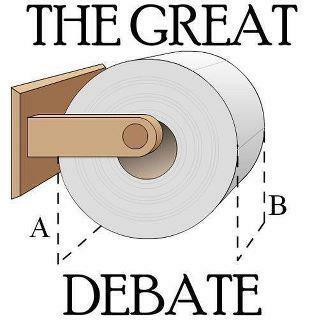 Rule #3: Do a sweep through the house at the end of each day. During your sweep pick up those random items that are out of place. Remember, once you have cleared your house of the unnecessary clutter this will get easier! Rule #4: Don’t go to bed with dishes in the sink. If there is one thing I can’t stand, it is dishes in the sink overnight. It just grosses me out. Rule #5: Get your family on board. Make sure that everyone picks up after themselves. Kids can be trained, and so can husbands! And if they can’t, get rid of them too. Just kidding! 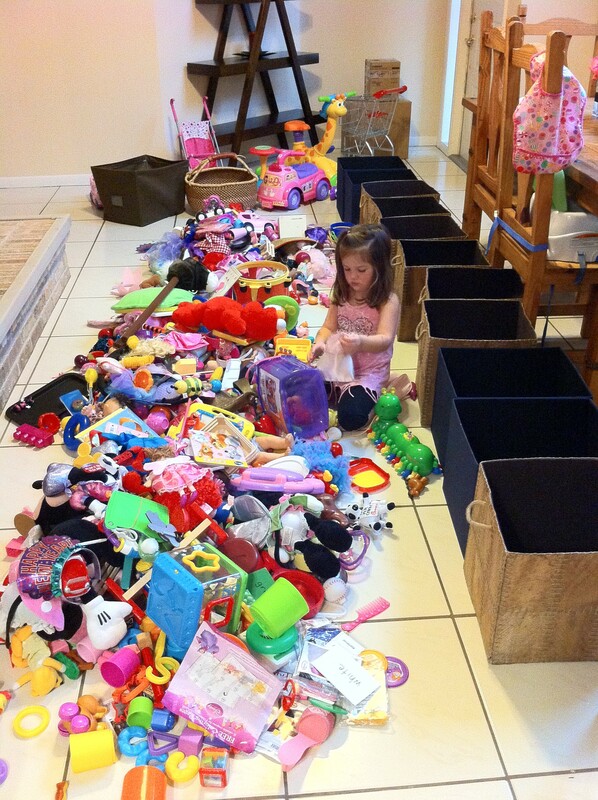 I play the sorting game with my girls when we clean up the playroom. I designate a different colored tub for different toys (pink tub = dress up stuff, green tub = kitchen toys, etc). They love it, most of the time, and clean-up is fast and easy. My loving husband is also well-trained (except for the aforementioned hat, sunglasses and beer bottles). We both work full time and we both share the responsibilities. When you first get started with “The House Blitz” system you will probably spend more than an hour in each room, but don’t panic! I spent an average of about 2 hours per room during the first cleaning. I promise you that the deeper that first cleaning, the easier each subsequent cleaning will be. And by the way, you will be killing two birds with one stone. I recently read that two hours of heavy cleaning burns the amount of calories equivalent to a fast food sausage, egg and cheese biscuit. So, maybe that is how I stay skinny. So, now all you have to do is decide where to start. Think about the room that has been bothering you the most. Maybe you have closed the door and chose to ignore because it seems too overwhelming. Instead, open the door and blitz the hell out of that room. Then, rationalize the junk food you eat later because you already burned off those calories while cleaning. Here is the dining room/toy room in the midst of a blitz. My daughter is helping sort the toys. The hubby’s hat and sunglasses. This particular day I found them on my side of the bathroom. Amy – what a great and timely blog post! I’m moving right now, and my house is completely chaotic. Unlike you, I am not a neat freak, and I have no idea where to start!! I have my piano movers coming this morning, and this post just saved my life. I can’t move my piano out of here unless I clear out the piles of junk I just pulled out from my closets to sort through everything. I’m getting the junk out of the room first and then putting things back where they belong. Thanks Judy, glad I could help:) Good luck with your move. When are you officially leaving?